Cinemanila is back this year and it just keeps getting better and better each year. If you did not know already, Cinemanila is probably the biggest and most respected film festival in the country since its inception in 1999. Some luminaries of the world film industry have already attended Cinemanila like film director Quentin Tarantino. 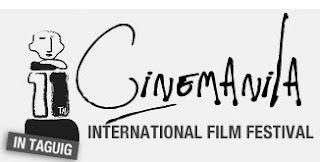 Read on to find out more on 11th edition of the Cinemanila Internation Film Festival. The Cinemanila International Film Festival was started because it wants to revive our country as the pinnacle of Southeast Asian cinema. It also encourages local films to push the envelope by developing films that are uniquely Pinoy and yet can compete with the international standard. For the list of films that will be shown, go here. For the screening schedules, please refer to this link. From October 15 to 25, 2009, Cinemanila will be in shown at key places at the Bonifacio Global City. Locations are the following: Serendra, the Market! Market! cinemas, Fully Booked's U-View and the outdoor field of Bonifacio High Street. Watch out in the coming days on our coverage of this year's Cinemanila.